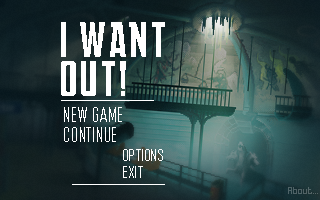 Adventure Game Studio | Games | I Want Out! How hard will it be for a single room game?? Well... The puzzles are well-thought and complex, but sometimes lack good responses from the protagonist. Otherwise they are very logic. The visuals, the atmosphere and the last cutscene are top-notch! I could easily see this game as part of a big adventure. Well done to the author! 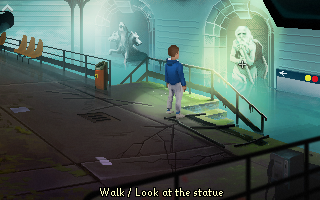 It's an adventure with beautiful visuals, decent puzzles and an interesting twist at the end. Fun puzzles and story. Graphics are wonderful, and polished. A true gem in the AGS Database! 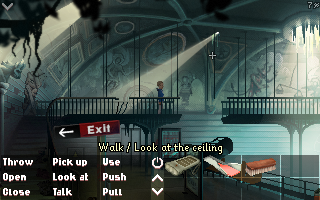 A beautifully painted adventure game in charming 320x200 pixels with some puzzly puzzles, just like you'd expect it. There are so many puzzles and red herrings put into this only one room (and an invisible basement), it's pure fun solving these on your quest to escape the room and you'll find quite some coin slots and tightly screwed on things on your way but you have no tools at first. Sometimes finding the correct verb to use for the correct action is a bit tedious, but it all makes sense once you solve it (or watch me solve it in the longplay linked above after you are stuck! ), and author NicolaGs even toned down one of these interactions on my critique, thanks for that. The animations of the boy and that stone plate are really pleasing to watch, the whole game is really polished! A great selection of atmospheric free music as soundtrack keeps you playing until you are through and is no distraction but gently comforts you along the way, just like it should. I really enjoyed this game. It packs a pretty good bit into a one room game. It also has some really nice graphics.